“Mud-puddling is the process of sucking-up liquids in order to gain essential nutrients, such as salt or proteins”, explains Marta. “It has only recently been observed in clearwing moths and, similarly as in other Lepidopterans, it seems to be restricted to males”. The newly discovered species was named Pyrophleps ellawi in honour of Marta and Paolo’s Malaysian friend EL Law who supported the team during their expeditions and who has a deep affinity for nature. Curiously, rather than resembling a butterfly’s relative, the new moth looks like an insect from a whole different order. It mimics potter wasps. “It has a slender body, long legs and transparent wings with a blue sheen in sunlight, similarly to some species of potter wasps”, says Marta. Furthermore, while observing the moth in the wild, the authors noticed that it does not only look like a wasp – it also flies like one. The new species seems to be quite rare. During the authors’ three expeditions to Malaysia, they managed to see only eight individuals with each of them seen on a different day. “So there we were: on our knees on a sandy beach, in the middle of the jungle, trying to film the 1.5 cm moth”, Marta recalls. “We didn’t have much time: a single clearwing would come around 2:00 PM and stay for several minutes only. We knew that once it flew away, we would not get another shot”. 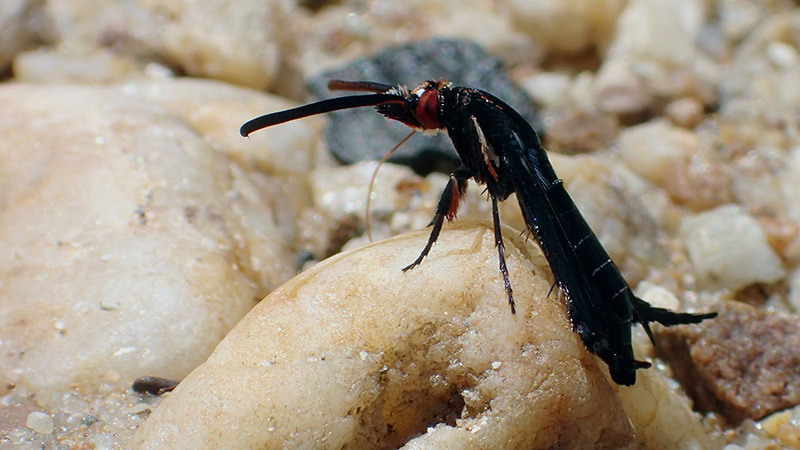 “Could it be that their rarity is the reason why the behaviour of clearwing moths is practically unknown and why there are still new species waiting to be discovered?” the researchers wonder.